"Nine killed you, nine shall die!" In the 1960s, the genre of the giallo sprang up in Italy, practiced by such directors as Mario Bava and Dario Argento. The giallo was a type of film that focused on a series of bizarre, highly stylish murders. One of the first such pictures in English was the incredibly stylish Abominable Dr. Phibes. Vincent Price plays the titular doctor, a horribly disfigured mad organist and theologian who is believed dead, but in fact survives in 1925 London and enacts a terrible vengeance upon the medical team who unsuccessfully sought to save the life of his wife. As a template for his murders, he takes the G'tach, or the biblical curses of Moses upon the pharaoh in the book of Exodus. The police, headed by Inspector Trout (Peter Jeffrey), are baffled by the crimes, which they seem completely unable to prevent. Joseph Cotten is featured as Dr. Vesalius, the head of the surgical team. Far more than any other film of its type before or since, Dr. Phibes is an exercise in style. The sets, designed by Brian Eatwell, are a masterwork of Art Nouveau with a dash of Art Deco, both fascinatingly detailed and lavish. The use of color is eye-popping throughout. The score by Basil Kirchin and Jack Nathan plays a hugely important role, for there is not a word of dialogue in the first ten minutes. Instead, we get a visual feast of ominousness, blended with nasty dark comedy. Especially notable is the use of pizzicato strings to generate a delicate but undeniable tension. Especially notable is Virginia North, as Vulnavia, Phibes' silent assistant. Her presence and completely outlandish costumes (and their instantaneous changes) lend an air of Magic Realism to the picture, which helps the viewer disregard a huge number of logical lapses and unanswered questions. This notion is underlined by the early sideways shot of Phibes at the organ, rising out of the floor of his house. Clearly, the actions of Vulnavia and Phibes occur in a different perspective and on some other level than that of the everyday world, represented by the completely ineffective and largely comical police. Indeed, on several occasions the two of them seem to be quite aware of the camera and the audience, whereas the rest of the world is oblivious. Price is absolutely delightful in a pantomimic role as Phibes; he speaks only with the aid of an electronic voicebox (a gramophone plugged into a jack in his neck). His performance edges into high camp, but is hugely enjoyable throughout. Peter Jeffrey and Norman Jones are good as the inept police, and the murders throughout are ingenious and often quite hilarious. Aubrey Woods is unforgettable in a tiny role as a twitchy and persnickety goldsmith. The combination of black comedy and grue is highly effective, and when combined with the music and art direction, this is an unforgettable package. The transitions from scene to scene and within scenes are clever and make for a seamless presentation. Even after dozens of repeated viewings, I still snicker at such moves as Scotland Yard man who declares, "There are a lot of very strange people practicing medicine nowadays,", which is followed to a cut of Phibes packing a black medical bag. As one might guess from this review, this is one of my very favorite films, and revisiting it on DVD has only increased my estimation of this entertainment. There is, however, a fair amount of implied gore (mostly involving rats eating one doctor alive), so it's definitely not for the very young. Originally rated PG on release in 1971, the MPAA re-rated it PG-13 in 1999. Image Transfer Review: MGM provides us with a luscious anamorphic transfer that erupts with color and detail. Prior home video versions of this film have been murky, open-matte affairs. Now with this DVD we finally see the clarity of the original release and its nearly psychedelic use of brilliant colors in connection with Phibes and Vulnavia. Shadow detail is excellent, and the framing is much improved here. No edge enhancement is visible, and while there is some film grain, this is an excellent presentation of a thirty-year old movie. A few specks of dust are visible, but no significant frame damage is seen. Audio Transfer Review: The 2.0 mono audio is a mixed bag, when compared to prior releases. Extraneous noise and hiss have been cleaned off, making things much clearer. However, the bass of the music is nearly completely lacking. The VHS version had terrific bass, especially during the many organ sequences and in the roar of Dr. Kitaj's airplane. Here, the organ sounds thin and weak, and is a terrible disappointment. On the whole, the sound is barely acceptable, and could have been much better. Extras Review: Sadly, there is practically nothing in the way of extras here. 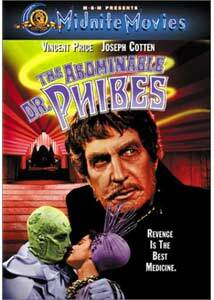 We do get an early theatrical trailer (presented in anamorphic 1.85:1) when the film was still titled merely Dr. Phibes. The menu is also anamorphic, and the chaptering is adequate. Nothing else is to be found, however. A highly stylish and enjoyable horror-comedy, given a beautiful video transfer but lacking in audio and extras. Very highly recommended nonetheless.